As many readers might know I do like mesembs. So this year I planned to attend the Mesemb Study Group event in Banstead and the Birmingham Autumn Show. The former is an exhibition of all the ‘mesemby’ genera (providing someone grows them of course), the latter is a competitive affair, this year shared with the Haworthia Society. There were 54 classes at the MSG event and 85 at Birmingham; so both were significant events. 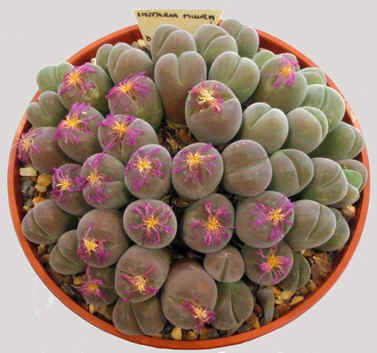 I arrived at Banstead early to get the branch sales plants set up and stage my two trays of exhibition plants, mainly Gibbaeum, small shrubby mesembs and a couple of the Lithops aberrant colour forms. Then a second breakfast was needed: a bacon sandwich was the first of many excellent items produced by the sterling band of helpers. 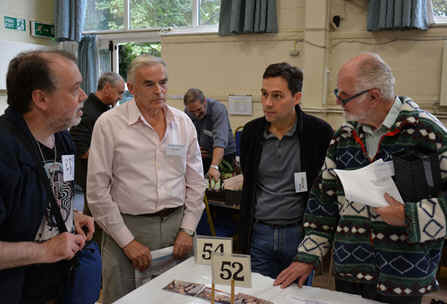 Many people I meet every two years at Banstead were there including Don Smith with whom I shared a sales table. He had some interesting plants grown from habitat collected seed gathered during his travels in South Africa and Namibia. He is seen with Jonathan Clarke, Peter Arthurs and ‘The Man on the Bicycle’ Anthony Mitchell, who explored South Africa in the 1970s and 80s. The people around the sales tables were animated, and as sought-after plants were found, they gradually drifted off to admire and discuss the exhibition plants. Right: Left to right; Jonathan Clarke, Don Smith, Pete Arthurs and Anthony Mitchell; a quartet of mesemb experts. Not often seen in cultivation, the flowers of Don Smith’s Astridia speciosa. One interesting aspect of the exhibition arrangement is that plants seldom seen in competitive shows make an appearance. 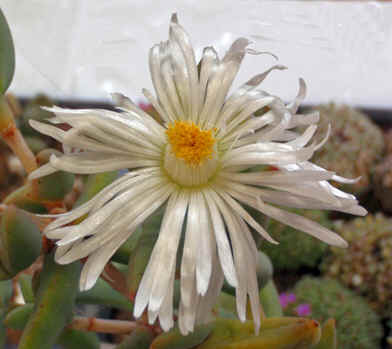 One example was Don Smith’s Astridia speciosa with its lustrous white flower; unfortunately my Astridia herrei did not oblige with scarlet flowers this year. Another was the diminutive Namibia cinerea found NE of Luderitz and exhibited by John Watmough, an accomplished mesemb grower. 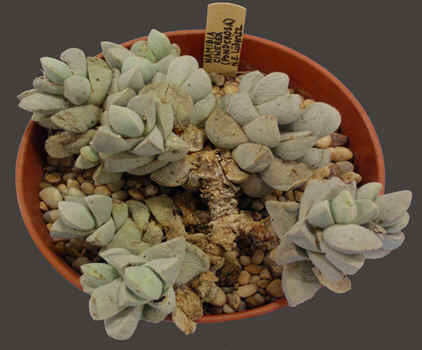 Other familiar plants included Eddy Harris’s Imitaria muirii and Peter Bent’s venerable pan full of Gibbaeum; both have been on the tables for many years. 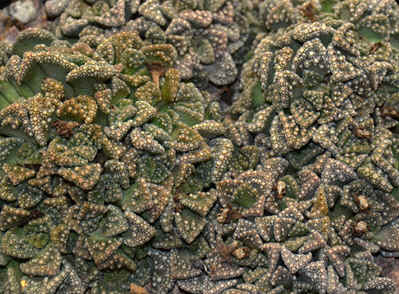 Large trays of seedlings offered opportunities to appreciate the finer details and beauty of plant structures: the Titanopsis species were fine examples. Another benefit of this study-group event is that visitors can experience the considerable variation in pots of lithops seedlings. Lithops coleorum and Lithops julii cv ‘Kikushogiyoko’ were notable in this respect. 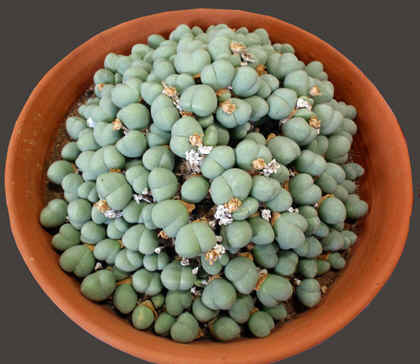 Right: Peter Bent’s venerable pan full of Gibbaeum. Far left: Seedling Titanopsis calcarea. Though with less variation there were many pots of conophytums in full flower; however C. burgeri always grabs people’s attention. Derek Tribble not only brought many plants for display, but also an exhibit of mesemb literature reflecting how fortunate we are to have web resources and enjoy modern publishing technology. He also staged an exhibit of mesemb seed capsules, complete with viewer and water-sprayer to encourage them to open as they would in habitat to release seeds. Right: Derek Tribble’s excellent display of mesemb seed capsules illustrating the variation within the family. For more click here. 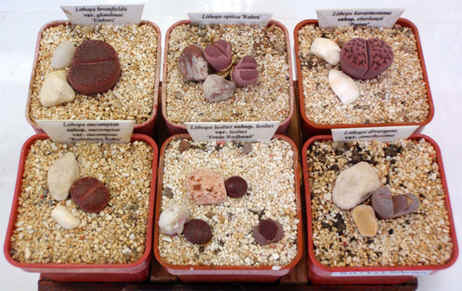 Far Left: Several plants of Lithops coleorum SH1500 from the type location show some variation in size and colour. "The correct spelling of some of the Japanese names is open to debate, but currently I do not have any information on "Kikushogiyoku". However, I suppose it is possible that some "Chinese whispers" have corrupted some of the Japanese spellings. There was an auction of twenty lots for the MSG Conservation & Research fund. It commenced with a fine Stomatium garden, followed by mesemb books, plants, and an ‘honorary’ mesemb, a fine three-headed Astrophytum ‘Snowcap’ (Left). I managed to go home with a nice Lithops julii ‘Peppermint Crème’ plant and a framed print of Aloe parvula, the work of the notable botanical artist Cynthia Letty. The auction also let me see my complete set of ASPS journals go under the hammer to a new owner; she was pleased to have them and the group has more funds to sponsor work in the field. Left: A great plant of Astrophytum 'Snowcap'.What is that doing here? Well it's an honorary mesemb when it is a lot in the MSG Conservation Auction. He went on to describe the project to re-introduce Lithops werneri to an important habitat. This was supported in part by the BCSS and 115 seedlings were planted in groups of 10-20 plants. Subsequent visits in 2013 and 2014 showed that many had survived, in particular those planted near Avonia plants (the Avonias may work as indicators of suitable conditions). Indeed seed capsules are now evident and some plants are now double-headed; a success indeed. Keith summarised the overall situation as follows: “Some lithops populations are safe, others are threatened and some sites have been lost. Ex-situ conservation is vital and you must all take really good care of your documented plants.” This was an important message to the attendees, echoed by Suzanne in her words of thanks to Keith. 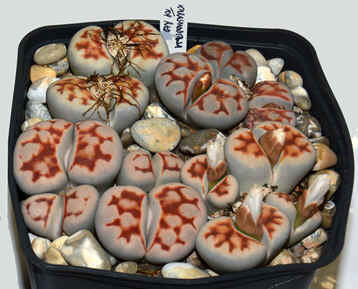 Keith Green’s display of new red cultivars, ‘Mahogany Lithops’. 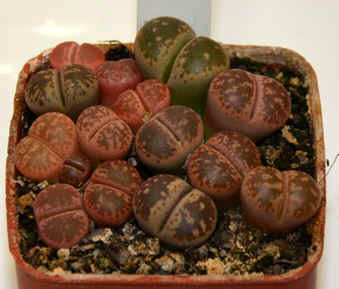 Lithops gesinae var. annae ‘Hanawared’. Some redder than others. 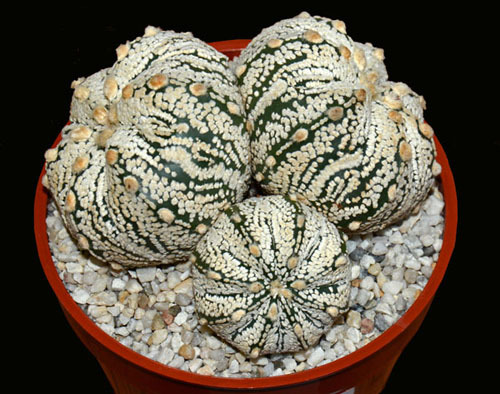 In my opinion Lithops cultivars are becoming more fashionable (as are those of Astrophytums and Haworthias) and the exhibition at Banstead reinforced my view. 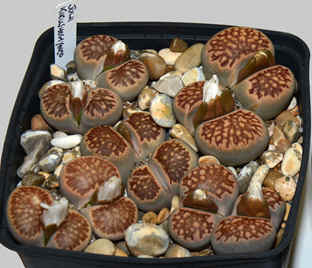 Keith Green himself put a neat exhibit entitled ‘Mahogany Lithops’ on the table showing six examples. 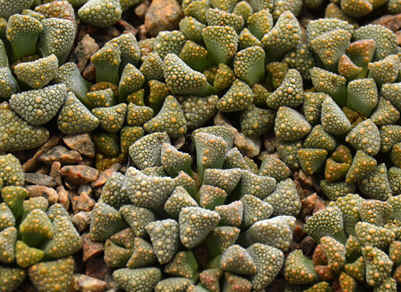 Two others took Trevor’s and my eyes; Lithops gesinae var. annae ‘Hanawared’ and Lithops karasmontana ‘Top Red’, a vibrant red mesh-patterned cultivar first published in 2004. 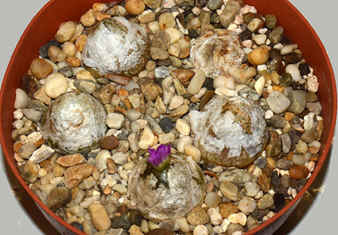 Details of both of these can be found on Keith’s lithops scrapbook website. The cultivars are becoming much more widely available in commerce, but Tony Irons was unable to get to Banstead and so I was prevented from taking more plants home. 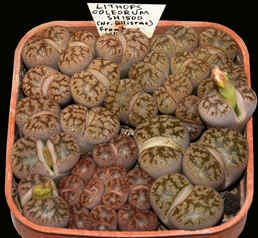 Fortunately I was in Birmingham the following weekend and Tony was there with lots of lovely Lithops, including many of of the newer cultivars! I managed to buy L karasmontana ‘Top Red’, ‘Brick Red’ and ‘Blood Red’ (the latter two not registered yet), also Lithops bromfieldii var. glaudinae ‘Embers’, featured in Keith’s display, and L julii ‘Hotlips’. They will join my L karasmontana ‘Sunstone’ and L. ‘Talisman’ both of which have flowered regularly in my greenhouse. Overall I made 21 entries in 13 classes at Birmingham and won 15 prize cards and the Horace Burton Bowl for most points in the mesemb classes (I was fortunate that other competitors did not enter all six of the mesemb classes). Also both my Eriosyce entries were placed in class-15 and I had ten new plants to take home so I had a jolly good day. There were many excellent exhibits, lots of sales plants and a good tombola, but my compact camera struggled to cope with the low light levels in the show hall. However the succulent planting on the terrace and a fine Aloe chabaudii in flower in the arid house caught my eye. 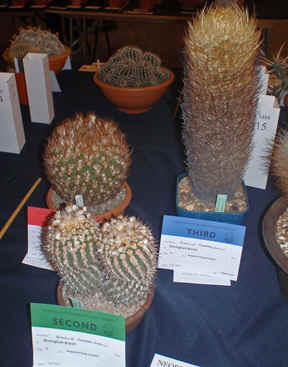 Right: (Ed) Roland won a second and third in this Eriosyce class at the Birmingham Show. 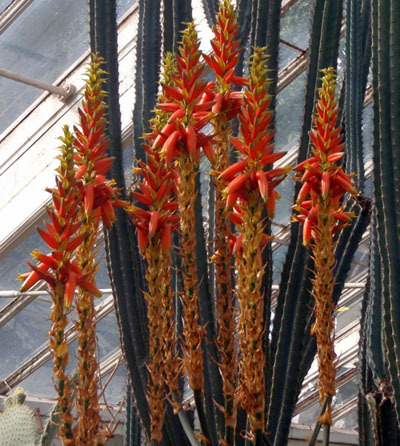 Far Right: Aloe chabaudii in flower in the Birmingham Botanical Garden arid greenhouse. Far Left: Roscoea purpurea for the garden. 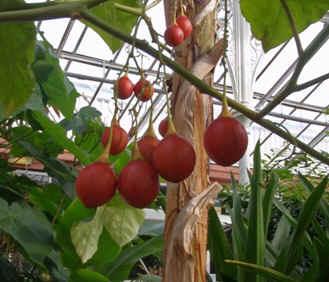 Left: The 'tree tomato’ or Tamarillo, Cyphomandra betacea from the potato family growing in a Birmingham Botanical Garden glasshouse. The Botanic Gardens at Birmingham feature many interesting plants and were colourful in the sunshine on show day. 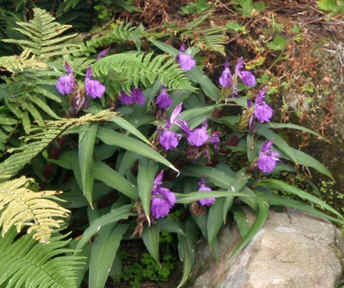 A clump of a new selection of Roscoea purpurea (Zingiberaceae) was striking beside the rock-garden pool, Cercis canadensis (Fabaceae) glowed with autumnal tints and in the greenhouse a fine potful of Cyclamen africanum was in full flower. Finally an interesting Chilean member of the Solanaceae was in fruit in the conservatory – ‘the tree tomato’ or Tamarillo Cyphomandra betacea; one for your greenhouse maybe? No, I think I will stick to mesembs.